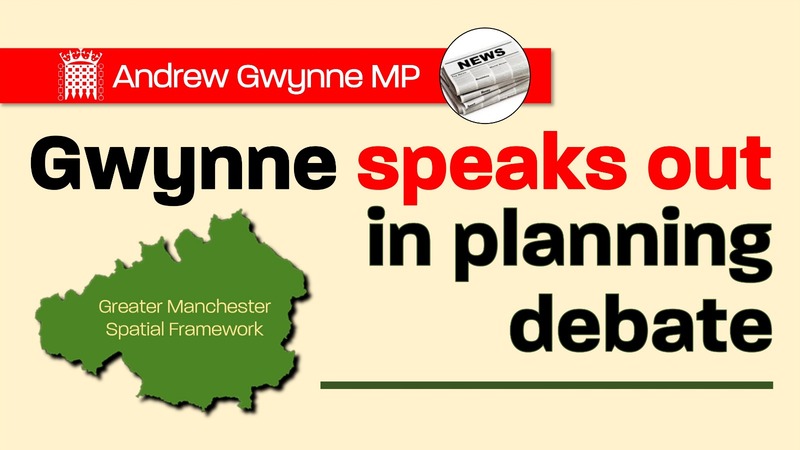 Andrew Gwynne, the Shadow Secretary of State for Communities and Local Government, has today spoken from the Labour frontbench a special Parliamentary debate on the Greater Manchester Spatial Framework (GMSF) which had been secured by Hazel Grove MP, William Wragg. The Greater Manchester Spatial Framework is the plan that will identify the land required to meet local housing and employment needs across Greater Manchester. The framework is a means by which the 10 Greater Manchester councils can plan collectively to deal with cross boundary and strategic planning issues. The first complete draft of the GMSF was published in October 2016, to which a large number of comments were received on the draft proposals. The main issue raised was about proposed development allocations on land currently within the Green Belt. The revised version aims to make the most of Greater Manchester’s brownfield sites and reduce the impact on Green Belt. But both Andrew Gwynne and William Wragg have raised concerns over green belt incursion in the Tame Valley for a number of years, and they joined forces last autumn in opposing the proposed Bredbury Parkway extension on the border of Bredbury and Haughton Green. The MPs’ also presented a petition to the House of Commons in October outlining both constituencies’ opposition to the scheme. Now the revised GMSF is out to public consultation. In the latest version of the plan, the amount of green belt land allocated for development has been cut by 50%, and residential development in town centres is identified as a priority. Unfortunately, uncertainty due to the ongoing Government consultation on assessing housing need and the current lack of clarity as to whether the 2014 or 2016 ONS figures are to be used in plans, means that it is highly likely that there will be further changes to the housing figures. Adopting a higher figure of homes needed for the area will lead to challenges for developers, councils and communities, with even more open space potentially being put at risk. Responding in the debate, Gwynne said that Labour wanted to see more devolution in planning to local communities and would go much further than the Government in helping people to shape the areas they live in for the future. Labour want local and community plans to be at the heart of a planning infrastructure that will include regional and national plans as well, with a focus on addressing disadvantage, as well as tackling regional inequalities. “We support giving some Mayor’s planning powers, as has happened in Greater Manchester. It’s a step in the right direction although much needs to done to make the plan fully workable. “Labour is also clear that we must protect our Green Belt. There must be a brown field first mentality. Otherwise developers will of course only want to build to on the Green Belt land first. “It was also an opportunity to speak from the heart about one proposal which will have a huge impact on my constituency: Bredbury Parkway. Let me be clear: I am still strongly opposed to the proposal to extend the industrial estate deep into the Green Belt at the Tame Valley, which is right on the edge of Haughton Green . It will destroy the openness and tranquillity of the two Nature Reserves that it borders, it will reduce air quality and will see an increase in HGV usage through the roads in my constituency. We have the same problem in greenfield, oldham. We need help to save our greenbelt. The proposed development will ruin the character of the village and the estate development will overwhelm the area. Let common sense prevail. It will also deplete our animal and nesting birds.